Of the estimated 2.96 million existing masonry buildings in the United States, a great many require energy retrofitting to meet contemporary performance standards. Existing masonry buildings lacking historic detail could benefit from an exterior retrofit that provides both additional insulation and a new appearance for the building. This project proposes an affordable, variable metal panel section that would modernize the skin’s appearance and bring tactility and scale to the new insulated envelope. Based on the existing Insulated Metal Panel (IMP) lamination system, ReSKIN parametric panels lend visual variety to a highly efficient envelope. The panels can vary in both depth of relief and degree of geometric complexity, affording a vast array of configurations. Customers choose the desired level of customization for their project, mixing standard flat panels with parametric ReSKIN panels. 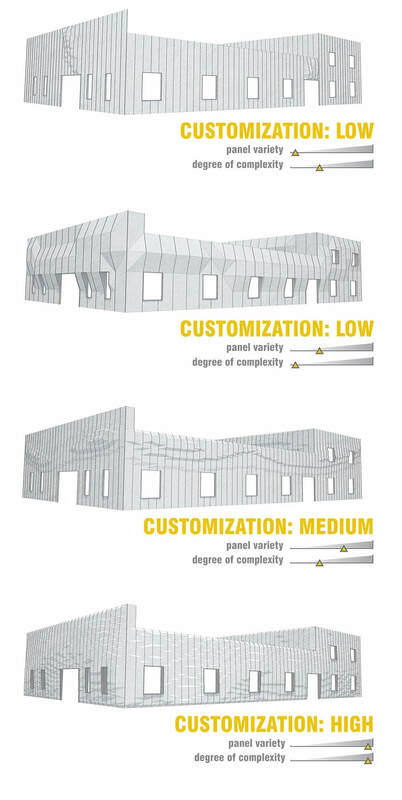 The ReSKIN modular, customizable panel system offers an intensively insulated and aesthetically individual retrofit strategy.